RevitaLash® by Athena Cosmetics provides safe, reliable, quality products for hair, brow, and eyelash enhancement. Strengthen and condition your hair, lash and brows with RevitaLash, an innovative brand that provides a range of products designed to improve the appearance and beauty of your natural hair, making it look fuller and healthier. 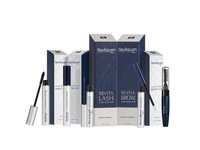 RevitaLash products will help you get the long lashes, beautiful brows and thick hair you've always wanted. Developed by ophthalmologist Dr. Michael Brinkenhoff, RevitaLash began with an eyelash conditioner that he created for his wife who had just completed chemotherapy treatment for breast cancer. Today, the line includes brow conditioning and hair thickening products that complement the eyelash formulas.